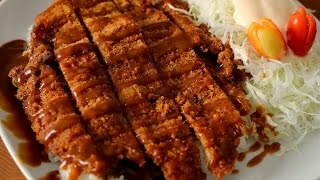 Today I’m going to introduce you to the Korean way of making a pork cutlet, called “donkkaseu” in Korean. 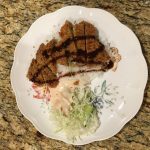 It’s an iteration of the Japanese tonkatsu which was the Japanese take on the European schnitzel. 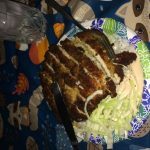 It’s a hot, savory, breaded pork cutlet, and my version is served on a bed of rice and Hi-Rice sauce, with a side of kimchi and a side of cabbage salad. These days donkkaseu is sold everywhere, in all kinds of restaurants, but when I was young it was only served in Western-style restaurants (called Gyoungyang-sik). That kind of food was new and exciting and they sold hamburger steaks, beef cutlets, pork cutlets, omelette rice, and steaks. It was more expensive than Korean restaurants, but it wasn’t totally a Western either: every dish was served with kimchi and rice, and usually a pickle, too. These days Western food is all over Korea, but in those days eating Western-style food with a knife and fork was an exotic thing to do. My friends would say: “Are you ready to use a knife and fork today?” We all knew what that meant! Donkkaseu! We thought it was so cool! The Hi-rice sauce I use goes perfectly with donkkaseu but if you can’t find it, you can use regular gravy, or even ketchup. Using Hi-rice sauce for this is my invention, but it really tastes like the donkkaseu gravy I used to have in those Gyoungyang-sik places all those years ago. The minute I tasted it, I was brought back to my old middle school days and my old friends in the restaurant! 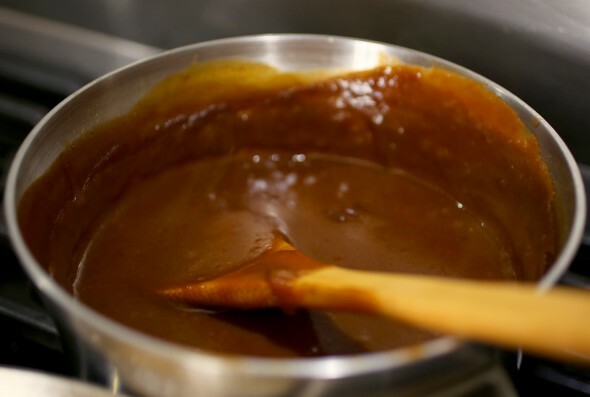 Someday I’ll make a hi-rice recipe for my website and show you how this gravy is usually used, but in the meantime you can use it to make donkkaseu. The word “donkkaseu” is an odd word, and I never knew what it meant until I started learning English. 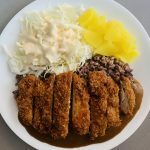 “Don” is based on the Chinese character for pork, and “kkaseu” is taken from the Japanese “katsu” which is their loanword for “cutlet.” The Japanese version of this dish is called “Tonkatsu” and donkkaseu is our Koreanization of that. It sounds kind of funny! 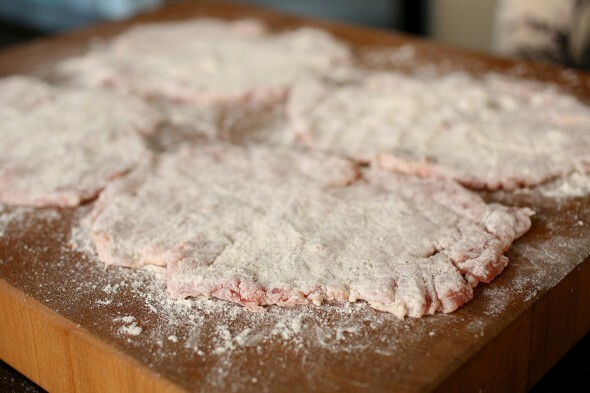 Use a meat tenderizer or (the back of your kitchen knife) to pound and flatten the sliced pork into cutlets about 7 by 5 inches and ¼ to ⅛ inch thick. Sprinkle one side with salt and ground black pepper. 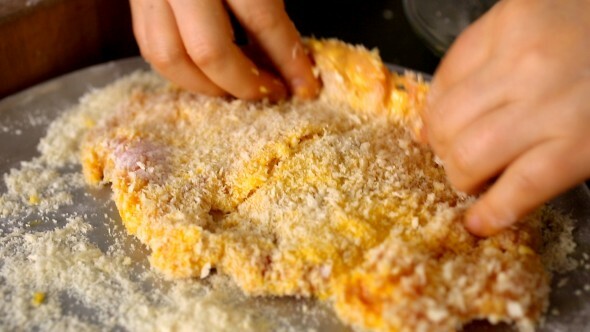 Coat both sides of the cutlets with flour, dip them in the beaten eggs, and press them into bread crumbs. Refrigerate. Combine mayonnaise, lemon juice, honey (or sugar), and ketchup in a bowl and mix well and refrigerate it. Heat the butter in a heavy sauce pan over medium high heat. When it’s half melted, add the hi-rice powder and stir well with a wooden spoonfor about 2 minutes until well mixed . Add water and stir well. Add the ketchup and mix well. Keep cooking, stirring occasionally for 8 to 10 minutes until it bubbles and thickens. 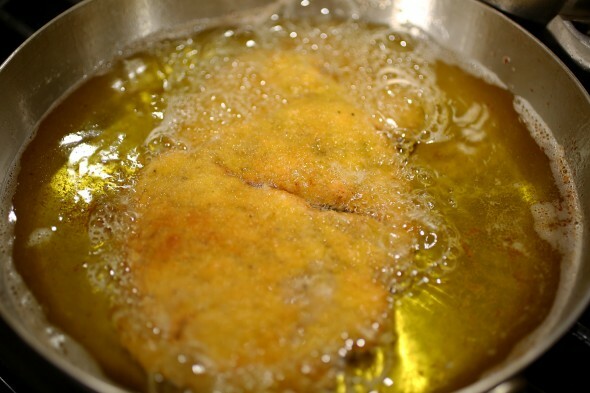 Heat up the corn oil over medium high heat until it reaches 350 degrees Fahrenheit. Fry the pork until both sides are golden brown, turning them over a few times with tongs. It will take about 12- 13 minutes. Strain the pork and pat off the excess oil with a kitchen towel. Put some warm rice on the plate. Ladle hot gravy over top of the rice. 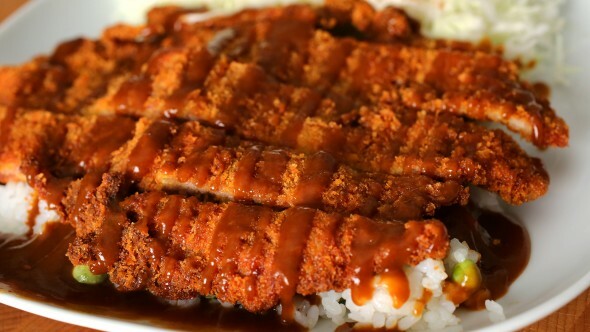 Put the sliced cutlet on top of the rice. Drizzle a bit of gravy over top. Place some shredded cabbage next to the pork and add cold mayonnaise dressing on top. Serve hot with kimchi or yellow pickled radish. Posted on Thursday, February 26th, 2015 at 1:59 pm. Last updated on March 12, 2015. Posted April 24th, 2019 at 12:46 am | Log in to reply. Another successful recipe!! ❤️❤️ Better than what I’ve ordered at restaurants! Thank you!! Posted April 24th, 2019 at 12:47 am | Log in to reply. Posted April 24th, 2019 at 3:25 pm | Log in to reply. Posted June 27th, 2018 at 7:43 pm | Log in to reply. So, I’ve been really itching to make your recipes and this is the first thing I went for because my family loves pork. They ADORED this and I loved it as well. I can’t wait to get the chance to make more of your delicious food and share more stories with you. Bye! Posted June 28th, 2018 at 7:53 am | Log in to reply. Posted December 17th, 2017 at 5:19 pm | Log in to reply. Hey Maangchi, what soup is it that is normally served with Donkkaseu at Korean restaurants. I wanted to make that also with this recipe. Thank you! Posted November 8th, 2017 at 7:37 pm | Log in to reply. Posted October 21st, 2017 at 8:51 pm | Log in to reply. This recipe is so good my family absolutely loved it and I will definitely be making this again! Posted October 24th, 2017 at 11:10 pm | Log in to reply. Congratulations! It looks very delicious! Posted August 16th, 2016 at 12:49 pm | Log in to reply. HI Maangchi!!!! Waving “Hello” from NH!!!! Made your Donkkaseu again today!!!! SO good, Love this stuff!!!!! Posted August 21st, 2016 at 11:23 am | Log in to reply. Donkkaseu time! Thank you for sharing the photo with us! It looks crunchy with juicy sauce! Posted May 31st, 2015 at 6:12 pm | Log in to reply. I want to make cheese Donkkaseu, but when can I put the cheese on your recipe..? Posted May 31st, 2015 at 4:01 pm | Log in to reply. Hi Maangchi, I visited Korea last year and I became obsessed with the food & the K-Dramas . I’ve followed your recipes to cook for my friends and they’ve always loved the food, actually this the first time I’ll be able to post a photo since before everything was gone before I had time to take one. Thanks for an amazing blog. Posted April 15th, 2015 at 3:04 pm | Log in to reply. My question is about the hi-powder for gravy. If I can’t find or get the Hi powder packet for the gravy..is there a Another substitute in the American grocery stores that may work..such as a beef brown gravy packet by a company like McCormick or any brown gravy packet that is easily available in general local store. I don’t think it will be the same at all unless there is some kind of gravy. Thank you and I love all your videos! Posted May 1st, 2015 at 1:05 pm | Log in to reply. I used the McCormick brown gravy packets and it came out great! Everyone loved it. Posted March 6th, 2015 at 12:48 am | Log in to reply. I tried your recipe with veal. It turned out great! My family loved it. I am planning to cook for my school this dish! P.S. do you by any chance have your version of Tongdak-Gui? Thank you! Posted February 27th, 2015 at 1:43 pm | Log in to reply. waiting for my chicken breast to unfreeze :D my grandparents grew their own chickens in summer (30 of them!!!) and their meat is sooo good (though I felt really guilty eating it… I saw them as cute little chicks ): ) as soon as I saw this recipe, I went to the shop and bought bread crumbs :D can’t wait! Posted February 26th, 2015 at 11:00 pm | Log in to reply. 튀기고 남은 기름은 어떻게 사용하세요? Posted April 14th, 2015 at 9:09 am | Log in to reply. People have told me to recycle…pour it through a strainer and put it in a jar. You can use it next time. That’s what I hate about frying things too. 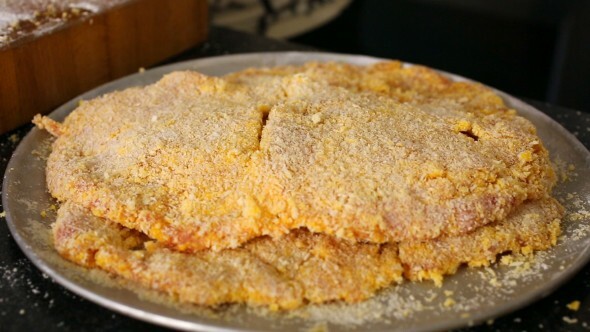 This recipe was originally posted on February 26, 2015 at 1:59 pm by Maangchi. It was last updated on March 12, 2015. The video was watched 2,435,566 times on YouTube & has 32,515 likes!